Think about this for a minute. You can make money on the internet without having a product of your own. You do not need to write a sales letter, buy any inventory, or even have a website. All you need to do is write a compelling email recommending our products and use your affiliate link to send your friends to our offer page (this will ensure that you get the credit). We will even help you write this email! And there is a lot of money to be made. My lowest price Solution product, the Total Transcript Solution, currently generates almost $145 per sale! Even though it is a $47 product, each sale generates almost $100 in recurring monthly income! I have done all the work for you! Think of all the people you can tell about our products…people you send emails to, email loops, Facebook pages, homeschool lists... the possibilities are endless. And you will earn a commission for each product sold through your recommendation! Let’s face it, many homeschoolers would love to homeschool high school, but are afraid of the typical high school issues (record keeping, transcripts, college admission.) I am here to take away that fear! My products have generated tremendous interest because they help remove that fear and empower parents to succeed! As one of The HomeScholar's affiliates, you are agreeing to these terms. 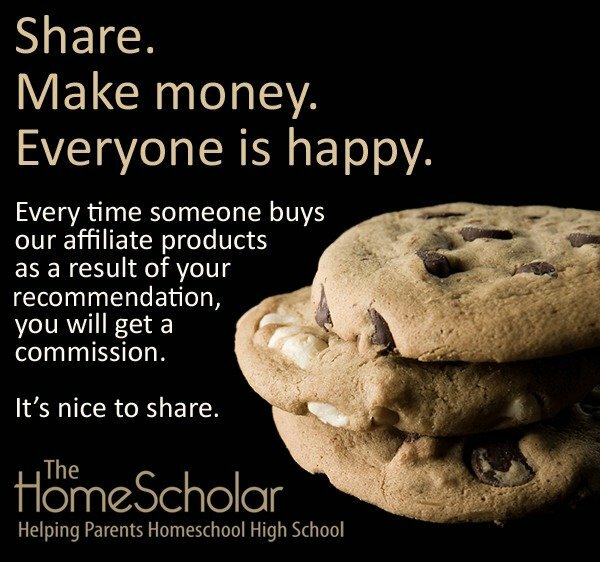 REGISTER HERE TO BECOME A HOMESCHOLAR AFFILIATE! Just fill out this form and after approval we will get you started earning commissions right away! Q2. Which of your products are "affiliate products"? This list will grow as we develop and release new products to help parents homeschool high school. Q3. Do your products generate recurring monthly income? Yes! The Total Transcript Solution and Comprehensive Record Solution both include a monthly membership in our Silver Training Club. The College Launch Solution has two monthly membership options, Group Coaching or Private Coaching. As an affiliate of those products, you will earn commission on the sale and any recurring payments. In addition, the Gold Care Club and Silver Training Club are both monthly memberships and you will receive affiliate income for as long as the customer remains a member. The High School Solution and the individual Parent Training Classes do not offer recurring monthly income. Q4. 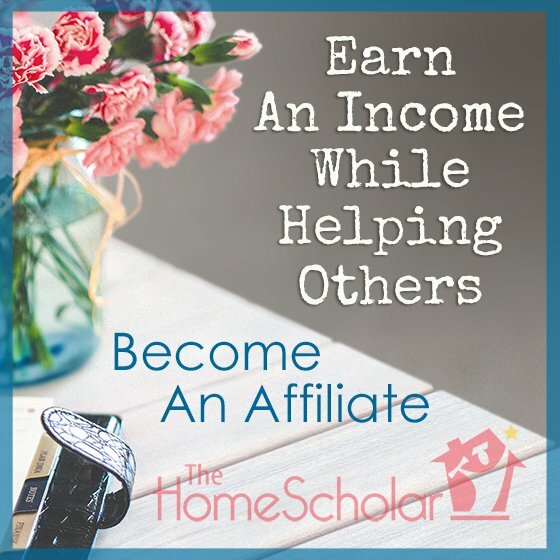 What is The HomeScholar Affiliate commission structure? We pay a 20% commission on all of our Solution Products and memberships (Total Transcript Solution, Comprehensive Record Solution, High School Solution, College Launch Solution, Gold Care Club and Silver Training Club). Our individual Parent Training Courses pay a 10% commission. Q5. Where do I find resources and creatives? Your images and sample tweets, Facebook posts and blog posts will be in our referral partner center accessible HERE. You must register and be accepted into the program to access the referral partner center. Q6. When will I hear from The HomeScholar? We will periodically reach out to our referral partners with promotion ideas and upcoming events. Q7. What is the cookie duration? We provide a 180 day cookie. This means that any customer purchases made within 180 days of clicking on your affiliate link will be credited to your account. Sales will be credited to you if the customer is not already cookied to a different affiliate. Q8. Will I be a good fit as a HomeScholar Affiliate? Do you love homeschooling? Do you have a passion to homeschool your children through high school? Do you love seeing your friends succeed at homeschooling? Would you like to earn some income while still keeping your focus on your children and your family? If so, you sound like a great fit for our Affiliate program! Q9. What does The HomeScholar stand for? The HomeScholar mission is "helping parents homeschool high school ." We believe that homeschooling through high school is the best possible preparation for college and for life. We believe that parents make the best teachers and guidance counselors. We believe that independent homeschooling provides the most successful homeschool outcomes. We believe that every child deserves a college-prep education, whether or not they choose to go to college. If you feel the same, we'd love to work with you! I love being a HomeScholar affiliate and helping defray the cost of homeschooling with monthly commissions. The HomeScholar team makes it so easy, with pre-written social media shares and blog posts or emails – I simply copy, paste, and tweak for my own audience. Thanks, Lee! I recently had the opportunity of working with Matt and Lee Binz - "The HomeScholar." We joined efforts for her webinar on homeschool grades, credits and transcripts and for her product, the "Total Transcript Solution." With over 375 people registered, over 50% attendance and 31% conversion rate, we were very pleased with the results. They are extremely professional and provide all the tools needed. I highly recommend them to any homeschool vendor considering working with them.